The topics covered in this blog are wide and range from topics of Language and etimology (the origins of words) to the nature of creative thinking to semantics, language, intelligence and cognitive science. There are puns and stories about words, odd definitions and fun ideas about cognitive science, learning and memory. Some of the postings here will contain citations or references to other books. Many other ideas are original; most are borrowed from things I have read and stories I have been told. I hope you enjoy these tidbits and find pieces of wisdom in them. Please let me know if you find any interesting. Some things, if faked, become real. As I write, I sit in a den surrounded by 15,000 books, that's about a book a day, every day, for thirty years. My reading habits developed early in high school and, by college, I have developed a voracious appetite for reading, a mostly science fiction, but with a healthy mix of technical non-fiction as well. Most people though attribute my readingprowess to some quirk or trick associated with speed reading. It is not. I probably read faster than more people, but the trick to reading a book a day is not SPEED; it is ENDURANCE. Consider a typical paperback book that is about 120 pages long. If you open the book to any random page, you can probably read a single page out loud in about a minute. True, you would probably be reciting words as fast as you can, but it would still only take about a minute to read one page out loud. Therefore, if you could keep up that pace, you should be able to read the average paperback book, outloud in about 120 minutes or two hours. So why does it take people a week to read a book? Because they do their reading in short sprints. They might read for fifteen minutes and then they stop. They get tired, or their eyes hurt, or they get sleepy, or they get distracted, they lose interest, or get a headache... and they put the book down. The next day they may pick up the book again and read for another fifteen minutes. Of course, they may have to scan earlier pages to recall what happened or where they left off, before reading new material for the remaining ten minutes before they put the book down again. The reason that most people take a week to read a book has more to do with the duration that they read and basic attention span than it has to do with speed. If you take a two hour task and performed that task in fifteen or twenty minute sections each take, of course it will take many days. It would be like running a marathon, not all at once, but rather running the marathons one mile per day. At more than 26 miles, breaking the marathon down into daily, one-mile segment,s would take a runner almost a month. Note the average runner completes a marathon in about four and a half hours. Indeed, you can walk that distance in about seven hours. The trick to completing a marathon in a single day, like reading a book a day has far more to do with endurance than with speed. Consider the individual who cna only run one mile without falling down gasping for air. If he runs and builds up his strength, eventually he will be able to run two miles. With more practice, eventually he will be able to finish a three mile stretch non-stop, and then four. With consistent training he will eventually be able to run the 26 miles. During that training he will build up strength and devleop stronger muscles and, at the same time, his speed will ioncrease too. Reading is the same. People can traing themselves to read for longer and longer periods of time and build up their endurance. Along the way, other benefits will accrue. You eyes will get stronger and your attention span will improve. You will be able to concentrate better and your memory and comprehension will grow too. And finally, your reading speed will increase. So that is the secret to reading a book a day. First you have to build up the endurance to sit in one place and focus sufficient attention that you can read or an hour or two a day. Then, in the time that you spend watching a single TV movie each night, you can read a book instead. Then, you will be able to take a book, sit down and read it in a single sitting. As your reading speed increases you can read longer an longer books, but you probably won't notice. When your reading skills advance to that point, you fill finds yourself "IN FLOW" and you will lose track of the passing of time at all. The hours will disappear in a blink and you will have journeyed much farther than you could have run, or driven, or flown in that time. Reading is a passion that has endured since my youth. I have travelled to placed few people have visted, met with people long since passed way, and share the dreams of people whom I have never met. What I know is far greater than what resides in my head. I am surrounded by the minds of thousands of others who speak to me with the words they recorded in print. If you practice and work up the strength and build the endurance, reading can become a passion for you as well. A favorite quote: There is little difference between a may who cannot read and one who won't. My favorite word is an unusual one. While it is an archaic word, no longer in common usage, some of its forms are still quite frequently used. The word is RUTH. R-U-T-H…like the name… but this word is a noun. It comes from the same root as the word RUE, which means to suffer or grieve. RUTH simply means “compassion”, caring… particularly for those who are suffering or grieving. A century or so ago, when the word was in fashion, people who had a lot of compassion or displayed a lot of it were called RUTHFUL. People, who HAD NO compassion or demonstrated none, were described as being RUTHLESS. You see, the opposite of compassion is not anger, or hate, or malice; it is indifference. In the same way, RUTHLESS does not mean malicious or mean-spirited; it simply means that someone does not care. RUTHLESSNESS is typified in Marie Antoinette’s alleged reply to the complaint that the poor people in her kingdom had no bread to eat. She responded, “Let them eat cake.” She simply didn’t care. Thus, if you are RUTHFUL, you are compassionate and caring. If you are RUTHLESS, you don’t care. If you think about it, a lot more people are killed in tehworld each day as the result of indifference than from malice or hatred. As a final note, it is important to point out one additional thing about the word RUTH. It is the relation between the words CARELESS and RUTHLESS. If you think about it, since RUTH means CARING, then the words RUTH-LESS and CARE-LESS should have similar meanings. However, we associate RUTHLESS with being cruel and spiteful while CARELESS is associated with thoughtlessness, inattention or clumsiness. In actuality though, the words are VERY similar. You see, CARELESS means that someone does not care about “things”, and as everyone knows, if you don’t care about things, things get broken. Correspondingly, RUTHLESS means that you don’t care about “people”, and sadly, when you don’t care about people, people get broken. Considering that people are more important than things, we seem to have lost focus, at least verbally, on appropriate targets for our attentions. We seem to be more concerned with care of objects than the care of people. This change in focus seems to truly reflect the priorities of our age and is demonstrated by the words we have kept and the words we have thrown away. So reflect a moment on the advice you often give to others. How often have you cautioned your children or your friends to “Be careful” when you should have counseled them to “Be ruthful”? Another interesting word is the word "Talent". Everyone know what it means. It is a skill or a special aptitude. One person might have a "talent" for sports; another a "talent" for music or mathematics. However, if you learn about the origin of the word, it may change how you think about such atributes and abilities. The word TALENT actually comes from the ancient measure of mass, or rather of money, dating back to the Romans and the Egyptians. The word's meaning, however, shifted from a mere measure of money when it was used in a parable told by Jesus in the Bible (Matthew XXV:14-30). In that story, a master leaves on a trip and give three servants each a talent of silver. Two of the servants invest the money and earn more wealth for their master before he comes back from his travels. The third servant, however, afraid to lose the money, buries it in the ground to keep it safe. Upon the master's return, the first to servants are praised for their initiative but the third servant is chastised for "wasting his talent". Thus, a "talent" is something of great value that needs to be used. ZIf it is not used, it is wasted. Moreover, a talent is something that you are given only temporarily, and if you do not use it wisely, it will be lost. If you think of a talent this way, you realize that our skills, and ability, our attributes and aptituddes, are gifts, temporary gifts. Athletic prowess will not endure into old age. Musical skills may decline over time as we lose the ear to arrest the sounds and the voice to echo it. Memory, sight and hearing, strength and energy all fade and fail us with the passage of time and the advance of age. Remember, the gifts we each have in our youth are indeed temporary. The skills we develop will not endure forever. Each of us gifted with special skills needs to remember that you are only given these talents for a short period of time... someday they will be lsot to us. They need to be used to their fullest in the short time that they are lent to us or they will be wasted, unused, like gold buried and lost, unspent and forgotten. If you recognize that each of our talents are, in fact, gifts, temporarily on loan to us... then you may cherish them more while you have them, and you may use them more fully, as well. So... learning the origins of words can change what they mean and how you think. Sometimes learning such things make the meaning of simple words richer and enriches us as well. But it has also been used in mathematics, when a small (nonrandom) sample of a population is used to represent everyone. I remember when I attended a cultural sensitivity class, called "White Men, Women, and Minorities" and I became disturbed when Causacians were characterized as old, rich, work-a-holic men, who hated minorities, had no home life and lived at work. Now half the class was white; we all worked for an hourly wage, and none of us were rich; half were female, and I don't think any of us were bigots. So I drew a bell shaped curve on a nearby whiteboard and circled a little portion near the tail of one end. I told the instructor that those were the people he was describing, and that his SYNECDOCHE was an unfair stereotype equivalent to the biased, racial bigotry that the class was about. I accused him of prejudging an entire ethnic group based upon the behavior of a very small subset and that he was committing the same form of racial bigotry the is unfair against blakcs, hispanics, asians, or any minority group. I told him that I could prove none of us fit his representation. I addressed the Caucasians in the calss and asked "How many of you, if given a holiday, go into work instead of being with your family?" No one raised their hands and I said to the instructor, "I rest my case." Not surprisingly, I was asked to leave. It is still a great word, and can describe the way mathematics and statistics are sometimes used improperly to misrepresent reality. Paraprosdokian sentences: A paraprosdokian is a figure of speech in which the latter part of a sentence or phrase is surprising or unexpected in a way that causes the reader or listener to reframe or reinterpret the first part. It is frequently used for humorous or dramatic effect. You know the nice thing about being a kleptomanic? You can always take something for it. A protester at a rally "Dylexics of the world UNTIE"
I may be schizophrenic, but at least I'll always have each other. I have a reputation for being absent minded, but i can't remember why. Did you hear about the agnostic, dyslexic, insomniac? He would stay awake all night every night worrying if there was a Dog. A word I made up because it seemed to be missing. The word "promethean" means innovative, insightful, creative. It comes for the Titan in Greek myth named Prometheus, who gave Man the gift of Fire. His name actually means FORWARD THINKING (pro, meaning forward, theseus, meaning thought. Few people will recall that Prometheus had a brother, named Epimetheus, epi - meaning after, theseus, meaning thought. Thus he was the god of "hind-sight" or after thought. In the same way that prometheus was forward looking, Epimetheus was backward looking. I came to create this word when denouncing critics or pundants who criticise other with the advantage of hindsight. They critisicms, I suggested, were erudite epimethean rhetoric. Bibliotherapist is one of my favorites. Throughout our marraige, my wife, Barbara, has always perscribed books for people; books on how to improve yourself, or guides to do-it-yourself tasks, books on psychology, or medicine, children, exercise, diet, nutrition, birth order, religion, spiritualism, hope, faith, forgiving, learning, intelligence and more. Books to inspire, inform, teach, explain, or enlighten. Indeed, she has always seemed to be a homeopathic physician who heals people (their spirits and their bodies) with books instead of with pills. 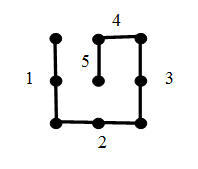 The problem is to connect all of the dots with the fewest number of straight lines, without lifting your pen. Try as they might many people cannot progress beyond this and reach a solution. Ultimately the solution is to literally think outside of the box. WHile teaching this class, I wanted to expand on the concept and suspected that there might be more solutions, but couldn't find any. Eventually, however, i had a flash of insight (because of my studies in multi-dimensional geometry, and thought of a way that I could connect the dots WITH A SINGLE STRAIGHT LINE. The trick is to realize that the shortest distance between two points in a plane is a straight line, but the shortest distance between two pointsin a curved space is a curved line called a "geodesic"
Here is the trick that I used. First I drew the dots in there original pattern. 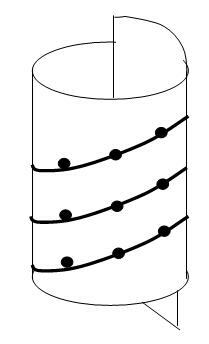 and then I connected the dots by drawing a single spiralling line around the rolled up paper, like the strips up a barber pole or a candy cane. When the sheet was unwrapped and laid flat, you could easily see the dots were connected with straight lines. When rolled up all these straight lines connected so they are a 'single" straight line (albeit on a curved surface. Now the thing that excited me was that I knew there had to be more solutions, but I could not immediately think of any. So the next time I taught the creative thinking class, I showed the original problem and then showed them the fancier solution whereby I could connect them with a single line. I told them that I knew of yet another solution, but that I would not tell them. I then gave them time to work in groups and that first night we discovered another method. The next solution looked like this. 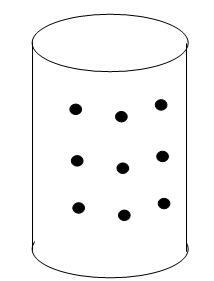 Then bend and fold the paper so the dots all line up. It was then that the real fun began. As I taught the creative thinking course, I tried different approaches to find new solutionsl. I found that if I just challenged them, they would give up. But if I told them that I knew of other soltuions, they would worked until they found one too. So the next class I told them I knew of two solutions to connecting dots with one line and tolld them that I knew of a third (I lied). But they belived me and they came up with a third solution. The next class, I showed them the three solutions tand told them there was a fourth. Every time I taught the class,we discovered more solutions, because the students adamantly believed that I knew of one. Ultimately I found more than 14 different solutions before I stopped teaching the class. Years went by and I forgot my "out of the box thinking" lecture, until one day a student showed me a handout. It was printed up by another teacher. Some of my students had passed their innnovative solutions around and as the courses were retaught over the years, still more solutions were found. I had lost ownership and bragging rights for connecting the dots with one line, but the excitement of finding impossible solutions and thinking creatively had developed a life of its own. That is how ideas work sometimes. If you let them go... they can grow and travel on their own. For your amusement, here ar eight other solutions that were discovered by my students during my time teaching these classes. My favorite is method number 4, where you fold up the sheet with dots on it so that all the dots overlap and then shove a pencil through the papers (the pencil being, of course, a straight line that connects them all). Note, I have not listed all the solutions here, just some of the best ones. Discovering new ones is more fun than reading about other people's solutions. Koans are stories, short riddle-like tales that are intended to teach people about Zen. They are fundamental part of the history and lore of Zen Buddhism. They can consist of a story, a dialogue, a question, or statement, the meaning of which cannot be understood by rational thinking but may be accessible through intuition. For example, a classic Koan is "Two hands clap and there is a sound; what is the sound of one hand clapping?" Almost all Koans address teh contradictions between language and reality. So much of our perception and understanding is tied into teh words we use. My favorite illustration of this is the following story. A Zen monk bursts into a hut where a student has been meditating on the nature of reality. The Zen master is waving a walking stick and demands the student answer his questions. "tell me quickly," he asks. "What am I carrying in my hand. If you tell me it is a walking stick, you deny reality. If you tell me it is not a walking stick, you deny fact. Qhickly! Tell me what I have in my hand." Then without giving the student a chance to answers, he proceeds to beat the student with the stick until he is bruised and bleeding. Then the Zen master throws the stick to teh ground and leaves the hut. What does this mean? Well, if I were a Zen master, I would let you meditate on this for four or five days while your bruises heal before I offer an explanation. What the Zen master was really talking about is "semantics", the nature of meaning. We often think of meaning in the context of words that we used to describe the world around us, but there is a problem with depending on words and extracting meaning form them. For example, thake the object the Zen master was waving around. What was it? Well, it was a walking stick. The Zen master himself said that was a fact. But he also said that if you called it a walking stick, you denied reality. So what was the objec tin the monk's hand? Well is was, in fact a walking stick, but the Zemn master also demonstrated that it was something else too. By beating the student he showe dthe student that it was a weapon, an object that he could bludgeon the student with. If you realize that the object the monk brandished was a walking stick, and a weapon, you can discover that it is many other things as well. It could be a piece of firewood, of a stick for cooking marshmellows, or a doorstop, or a stake for a tomato plant... or a thousand as yet unmade toothpicks. Indeed the walking stick is all of these things and more. You could spend days or eyars naming all the things that walking stick could be and never reach an end. So the fact is that the object was a walking stick; the reality is that it is also many other things, more than you could name. The problem with semantics and the meaning of words, is that we confuse the "word" with the "thing". Words enable us to understand and share our thoughts and they also allow us to convey complex ideas, but they can also limit and constrain us. By our nature, when we start thinking of an object as a walking stick, we become comfortable with that limited idea, and we stop thinking about all the otheer things that the object is as well. One of the precepts with Zen is to break out of those constraints and to look beyond words. "Thought is a bird that in a cage of words can spread its wing, but cannot fly." Much of Zen is an attempt to break down the barriers of words to reveal greater understanding of the reality that the words obscure. You need to remember, that things are more than we think they are. And almost always, when we think we understand something, we almost certainly have it wrong. Finally, take a lesson from the Zen student. If you only think of a stick as a walking stick, you will never know when to duck. If you thinh about it, you will find a stratling difference between language and reality. In the real universe, there are no opposites. Opposites only exist in spoken and written langugage. They are artificial abstrations that have no validity in nature. For instance, in language HOT and COLD are opposites, but in nature these two things don't exist. There is no such thing as HOT and COLD, there is only HEAT and ABSENCE OF HEAT. In nature, (with the exception of physicla symmetry... like UP and DOWN, NORTH and SOUTH) there are no such things as OPPOSITE,. There are only PRSENCES and ABSENCES. Similarly, in nature there are not things like LIGHT and DARK. There is only LIGHT and ABSENCE OF LIGHT. The presence of a physical attribue does not have an opposite. It only has less presence. You can have lots of rocks that together are HEAVY. But if you remove some of them, if there is less presence, they are LIGHT. Presenses reflect real phsycial things. You can turn on a LIGHT, but you cannot turn onj a DARK. Light is either present or absent. Similarly, you can add or remove HEAT, but you cannot turn on a COLD. Cold is merely the absence of HEAT. Opposites exist in language, and therefore they exist in our thougths and perceptions. But just because we can describe opposites and think about them, does not make them real. Words and language cna therefore confuse and mmislead us, without our even recognizing the fact. In reality, there are no opposites, only presences and absences. You can extend this concept to other polarizing or dichotomous concepts in language. For instance, LOVE and HATE might not be opposites. AS noted in a earlier etimological discussion of the word RUTH, you might notice that the LOVE and COMPASSION are presenses and their absence is not HATE but rather is INDIFFERENCE. Similarly, FEAR might be the absence of FAITH or COWARDICE the absence of COURAGE. I leave it as an exercise for readers to find other antipodal concepts and deconstruct these potential opposites into their corresponding presenses and absences. “An artist is a man who can paint and old woman and you can see the old woman in recognizable detail. But a GOOD artist is a man who can paint and old woman and you can see the young woman she once was. SEMIOTICS is a	relatively obscure branch of philosophy. It is the study of the nature of symbols. It ahs three sub-branches; SEMANTIC, SYNTACTIC, and PRAGMATICS. SEMANTICS is the study of the relation of meaning to sybmols. For instance, what does the word RED mean? And what does the number 3 mean? Semantics is a fascinating field. You can study the theories of denotation, extension, meaning, and truth. You can learn about logical syllogisms, the nature of paradox in language, general semantics and more. 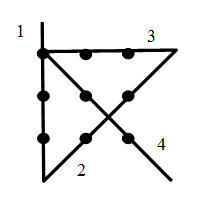 SYNTACTICS is the study of the relation of symbols to other symbols. In language syntax symbols might be best represented by adjective or adverbs. These are word that have no meaning per se by themselves. They exist primarily to modify the meaning of other symbols. For example, consider the following three sentences and note the words that are capitalized. See how the introduction of very simple words change the meaning of the other words and can dramatically alter the message. Again, like adjectives and adverbs, these symbols have no meaning, per se. A plus sign have no numberic value. The last branch of Semiotics is PRAGMATICS. It is the study of the relationship between symbols and people. Not surprisingly there are some different variations on the nature of pragmatics. This last branch includes lots of things, like context, inflection, body language. It is hard to give an example in writing, but inflection in one's voice can alter the meaning of a simple sentence. For instance, you can say to someone "That's really good" and say it like you mean it. However, you can also roll your eyes and emphasize the word "really" to convey the opposite message. "Oh, that's REALLY good"... meaning that's really bad. Thus body language, tone, even volume can augment, alter, or even negate words in that original message. The meaning of a sentence can be different if it is spoken, written in an email, shouted, sung beneath a balcony, or carved on the outside of a clay pot. Oddly, semiotics forms the basis of both mathematics and philology (abstract language theory) and in the human brain, both math and language are symbol based and are processed in the left hemisphere. The rightside of the brain specializes in non-symbolic processing, music, art, interpreting expressions and emotions, etc. The human mind is a strange thing. Its workings have always fascinated me. I have read a lot of books on decision making, and learning theory, memory, and psychology, but still am fascinated at the intricacies of the human mind, consciousness and awareness. We have been told that the human beings only use 10% of their brain. That always bothered me, but I did not question it until one day when our family went out for brunch after church one Sunday. At that time my son, Michael, and I were into codes, cryptograms, mind teasting puzzles. As we sat down for dinner, he took out a piece of paper upon which he had written letters. It was a word with the symbols all scrambled up. We had played this game before and I was pretty fast at unscrambling words, so Mike had gotten to using longer and longer words. In this case, he had taken a long ten letter word and mixed up the letters. I stared and stared at the piece of paper but I couldn't figure out the word. As I declared that I was stumped, our food arrived and we settled into our meal. After we were done we all got up to leave and, as the waitress picked up the plates, the piece of paper fluttered to the ground. Mike picked it up and handed it to me and I glanced at it and said the word. Mike frowned and complained, "That's not fair, Dad. You worked on that all through lunch." I replied, "That's not true. I didn't work on it at all." and then realized that I had lied. If I hadn't worked on it, then where had the word come from. I had tried before the meal but had given up. It was then that I realized that I HAD been working on the solution all during lunch.Ii just wasn't aware that I had been. It was my subconscious addressing the problem, long after my conscious mind had moved onto other things. I thought about the 90% of our brain that we don't use. What if we do, but we just aren't aware of it? What if the mind is like an ICEBERG, where 10% sticks up above the water and is visible, but the other 90% lies beneath the surface of the water and is out of sight? I remember when I was young. My grandfather was a carpenter and had a workshop with old tools in his basement. One that fascinated me was the huge stone flywheel. If I turned the handle the flywheel would turn. It was aard to turn the handle becuase the stone wheel rotated five times for every turn of the handle. But it was superbly balancde and, once I got the wheel moving, it turned with blinding speed. The massive stone wheel had so much inertia that he could sharpen several tools before the wheel slowed down. I used to work to get the wheel turning as fast as I could and would then run upstairs to bring grandfather down to see. And the wheel would still be spinning. What if the mind works like that? You consciously work on a problem and try and try to find an answer; you get your mental flywheels turning and then you give up and turn your attention to something else. But while you are somewhere else, the flywheels continue to turn. You unconscious mind keeps trying to solve the problem even though your attention has gone somewhere else. Thus, when Mike showed me the piece of paper, the answer came to mind. I had not consciously worked on a solution, but my subconscious had found one while I was away. This happens to all of us. We try to remember a name or a phone number... and cannot recall it. As we give up, the answer appears unbidden and unexpected. Our minds are like that. It is not true that we only use 90% of our brains. It is just that we are only aware of 10%. The rest is working, unnoticed, out of sight, behind the scenes, processing information and memories without conscious thought or direction. Over the years, I have tried to use this unsuspected capability. I multitask from one item to another. I work on a problem until I can go no further. I get the flywheels spinning as fast as I can and then...Ii move on to another task. Eventually, I come back often to find the answer in front of me, the problem solves or the missing connection found. I have found that, if I nurse a problem, thinking about it frequently and revisiting it, the problems are simple when I come back to them. I have often thought about topics, over and over, until, finally, I just sit down and write a twenty five page paper in one sitting. Everything is there, all the ideas and topics organized without my being aware that I had done all the work without thinking about it. My wife says that I have a cuissinart where I pour ideas and leave then to churn and churn until they are pureed and ready to pour out. Which ever analogy you use, flywheels or food processors, the mind is far more versitile and powerful than most people suspect. Harnessing the subconscious mind to work on things while you attend to others is a great effort-saving technique. Problems seem to solve themselves and complex tasks are made easier. Years ago, psychologists tried to figure out why people like games. The watched and analyzed and measured people and discovered a lot of things. For instance, when people enjoy a game, they often experience a distorted sense of time. The feel they have been playing their video game for only a few minutes only to look up and find a couple hours have gone by. Another aspect is concentration. My wife has often commented that, when I am reading, a tractor could crash through the wall and I wouldn't notice unless it ran over my toes. Yet another aspect is energy. It's not until you have stopped your game of sand-lot football that you realize you are exhausted and hurt in places you had forgotten you had. Psychologists, and a researcher named Mihaly Csikszentmihalyi in particular, came to call this phenomenon FLOW. Ther eare other characteristics and conditions that allow people to enter this state, but it has been called a "semi-mediative state of intense concentration'. Others have gone to far as to call it the optimal experience. Colloqual expressions to describe this mental state include: being in the zone, in the groove, in the present, wired in, etc. Some people get into flow reading, or playing video games, or writing, or painting, or playing music, or mediating or praying,or cooking, or solving puzzles, or working in photography, or working in the garden, or working with wood, or motorcyle repair. Notice how some of these activities now include the word WORK. In such cases, if you have a job where you can get into flow. If you have one of those jobs where you experience "five-minute" days, where you come into work get focused on a task and look up to find that you missed lunch again or people are leaving the office and turning off the light. If you have a job where you can get into flow, then you are lucky. Psychologically you have a job that is indistinguishable from play. Flow has been described in may books. Tom Demarco's PEOPLEWARE, which analyzes factors that affect the productivity of software projects talks a lot about Flow. Many types of meditation and self improvement endeavor to direct people to this state of mind. There are a number of factors and prerequisites for people to get into Flow. There are personality factors (some people have never experienced this condition). There are environmental factors (subjects need to avoid being interrupted). I personally spend far too much time in FLOW and often have those five minute days. I used to experience it when I was training for marathons. I feel sorry for those who never experience this. One of my favorite quotes is that "We see in genius our own rejected thoughts"
And it's true. When we hear something we consider truly remarkable, we often respond by thinking "Oh, I thought of that" or "I should have thought of that"
For example, I have decided that there is an "inertia" to ideas. If you have an idea and give it to one person, it is easy to communicate and convey. If only one other person is involved, decisions can be made quickly and with relative ease. However, if you are dealing with a group, it is not so easy. Now you have multiple people to whom the idea needs to be conveyed. They may discuss it, back and forth, and debate it or analyze it more. This takes time. If one person disagrees then others wll be reluctant to accept. Consensus building takes longer and is harder. On the extreme, if you are trying to get a new idea accepted by an entire company or organization, then teh simplest ideas meet and wall of resistance. It now requires a veritable culture change to get the new idea heard, let alone accepted. There was aGerman scientist named, Ernst Mach, who tried to explain inertia. He argued that "local physical laws are determined by the large-scale structure of the universe.... that mass out there affects inertia here"
By way of analogy, he said, imagine a line of force between this object here and all the other matter in the universe. If you try to move it, you have to break some of those lines of force and the more lines there are, the more inertia on this object. This is called Mach's Principle. It suggests that if there were only half as much matter in the Universe, that the inertia on a object here next to me would only be half as great. that the same force would result in twice the acceleration. This is a principle not a theory, because we can test theories, but we cannot test this... since it is difficult to change the amount of matter in the universe. In the extreme case, if all the other matter in the universe were gone, then one would suggest that an infinitely small force would produce an infinitely great acceleration on this last remaining peice of matter. if course even that would be ahrd to discern because there would be nothing else to pass as we move. In the same way, Ii believe there is a psychological or sociological equaivalent to Mach's rpinciples as they allpy to ideas and decision making. The inertia, or difficult to achive change is directly proptional to the number of people involved. The more people the harder it is to change or to sell an idea. It is just an analogy, but it conforts me to find explanations for social or behavioral phenomenon when I examine them. When people are young, they do not know much, but they don’t even know enough to realize what they don’t know, so they are content. This is the First Stage of Ignorance. Eventually, people discover that there are things they don’t know about. This makes them dissatisfied. Their curiosity drives them to ask questions, and by doing so, they learn. This is the Second Stage of Ignorance. After a while, when they’ve asked many answers and learned many things, people usually become satisfied with the answers they’ve found and they become content with their knowledge. As a result, they stop asking questions, and they also stop learning. This is the Third Stage of Ignorance. Rarely do individuals recognize that despite long years of learning, their knowledge is still incomplete. Despite their knowledge, they have stopped learning. When they can learn to question once again the things they know; when they can ask questions that they already think they know the answers to; when they are never satisfied with their knowledge and when the questions become more important than the answers…. then their learning will continue forever. This is the First Stage of Wisdom. Once people have learned to question everything, a few individuals realize that, even after a lifetime of learning, their knowledge can never be complete. When people understand that no matter how long they live or how much they learn, they can never fully understand a single subject, topic, or thing. Indeed, when they can accept that the number of things which they can never fully comprehend is infinite and unbounded…and when they can be at peace with that reality, then they have achieved the Second Stage of Wisdom. At other times, however, I offer this as a possible answer. The Third Stage of Wisdom, for me anyway, is achieved, when someone realizes that all knowledge is illusion. Knowing is a fraud and a lie. Indeed, what you think you understand, you probably do not. Moreover, the things you understand the most can usually not be conveyed to someone else. Siddarth said that wisdom could be learned, but not expressed. Knowing is very different from Wisdom. Knowledge is finite and often bound in words. Moreover, it is transient in nature. What is known is often forgotten. What is important to you may be meaningless to someone else. Knowledge is both transient and fleeting. Common knowledge gets taken for granted and is not taught. It thus becomes uncommon and often fades and disappears over time. Truths become stories; stories become legend; legends become myth and myths vanish as time passes. Year piles upon year and knowledge is irretrievably lost, buried with forgotten generations of people who cherished such facts and truths. Stories untold disappear. Entire languages pass away and along with them the cherished knowledge of entire civilizations. Nothing endures. All knowledge is as transient as a passing thought and as insubstantial as a forgotten memory. The purpose of life, you see, is not to know. You cannot know everything and cannot even grasp your own ignorance. The purpose of life is not to know; rather it is to learn. It is the asking of questions that leads to wonder and curiosity. It is the act of learning, not knowing, that leads to excitement and horror, surprise and awe, majesty and revelation. Learning makes us new with every new thing we discover. But knowledge makes us old with every futile pointless fact we strive to hold and embrace, to protect from the ravages of time and the frailties of memory. When you can ask, and learn, and know, and do not care. When the questions are more important than the answers; When the journey is infinitely more important than the destination; When you can seek, and find ,and continue seeking, yet never lose the wonder of a child turning over a rock to see what you can find… then you will understand and experience the Third Stage of Wisdom. Some questions don't have answers. Indeed, there is an axiom that if you cannot answer a question, then you need to rephrase the question. Once, when my son was young, we were watching a TV show called BLACK'S MAGIC (starring hal Linden from Barney Miller and harry Morgan from MASH) It was only on for one season (1986) and was a spinoff of popular detective series at the time.In this case, it starred a stage-magician (Hal Linden) who helped people solve crimes. In one episode, there were two politians in an election campaign pitted against one another. One was a good guy, the other quite evil. After setting up the story, the good politician is given a tip that the bad guy is up to no good and is headed to a rendezvue with his corrupt partners. The good guy follows the bad guy through side streets of San Franciso and ends up on a street with identical apartments. He parks on the corner beneath the street sign that says Columbus Street next to a garbage can of holiday wrapping paper and a poster of himself with a mustache drawn on it. Hurrying to follow his evil opponent, the protagonist goes to the end of the street where there is a huge palatial house with a large courtyard. As he peeks in, he sees the bad politician arguing loudly with someone. The bad guy abruptly pulls out a gun and shoots the individual with whom he is arguing. Turning, he spies our good guy and starts spraying bullets in his direction. Our protagonist runs back down the street to his car and fumbles with the keys, but he can't get the keys in the door as the bad guys approache,s still firing bullets. The good guys run and runs and runs. Eventually he finds a police car and recounts the tale of murder. The cops drive him to Columbus Street where he finds his car and the garbage can the disparaging poster and the line of identical apartments, but at the end of the street... there is a cliff. The large house and courtyard, the murderscene and indeed half the street is gone... simply gone. At this point my son asked me, "Daddy, where did the street go?" Rather than answer him, I replied, "That is the wrong question. That question doesn't have an answer." But my son insisted, "Tell me Daddy, you know the answer. Where did the street go?" My reply remained the same. "You are asking the wrong question. Ask a different question." The episode dragged on, the good politician was deemed to be hallucinating. Reporters found out about his claims to the police.The new story grows into a scandal and threatens to ruin our heroes political career. Hints to the riddle were laced throughout the story. But my son continued asking the same question over an over again until the show was almost over. Finally I said, "Mike, I keep telling you that you're asking the wrong question. Let me offer a few others instead. First, can you move a street?" Then I asked, "Can you move a car, a street sign, a garbage can and a poster to a nearby street?" Mike's eyes grew wide and he saw the solution. The murder had been a set up to make the good politician seem insane so he would lose the upcoming election. The magician-detective explained the facts to those involved and the nefarious plot of the bad guys was revealed. The whole point of this is that some questions simply do not have answers. If you ask an unmarried man the question, "Do you still beat your wife?" there is no answer to that question. Questions often have embedded assumptions within them. Asking the wrong question can preclude the answers you are trying to find. One Zen-like approach is to examine the question itself. Often within the question is another, simpler question. For instance, instead of asking "Where did the street go?" you should first ask "Did the street go?" In general, if you are asking a question for which an answer cannot be found, try asking different questions or rephrase the question or break it into smaller peices. Don't make assumptions and bury them in your questions. You questions can actually preclude the answers that you want. Ask lots of small simple questions and the answers may be easier to find. Patient, nervously: "I'm a tipi !, I'm a wigwam ! Psychiatrist: "Relax,... you're two tents." Question: What do you get if you cross an atheist with a Jehovah's witness?Answer: Someone who knocks on your door for no reason at all. Question: What does an insomniac agnostic dyslectic do late at night?Answer: Lie awake wondering about the existence of dog.